How Consent Manager Can Help You Obtain GDPR-Compliant Consents? In this article we guide you through the most important characteristics of consent under GDPR. We also talk about GDPR consent manager – a useful tool that helps you collect, manage, and store all the relevant data in alignment with the new EU law. New rules around consent can lead to a lot of sleepless nights. However, it must be remembered that the new Regulation was created for a reason – to protect users’ privacy and to help restore trust and transparency of activities between ordinary people and the entities which process their data. Studies show that there’s a lot of work to be done. The 2017 State of Consumer Privacy and Trust survey conducted by Gigya found that 68% of respondents don’t trust brands to handle their personal information appropriately. Now it’s about to change. Ok, but what exactly is going to change? As you surely know, GDPR introduces some major shifts in many aspects of processing users’ data. The new law also makes significant changes in the definition of consent. Here’s a comparison of the new definition of consent and the one from 1995. As you can see, GDPR introduces a new clause, as consent now must be unambiguous and involve a clear affirmative action. It’s enough to say that the definition of consent is rather general and doesn’t provide you with actionable tips for your compliance strategy. But don’t be afraid! Fortunately, there are many documents and guidelines interpreting the provisions of GDPR. One of the most important (and helpful!) of these guidelines is the one prepared by Article 29 Working Party. Their “Guidelines on Consent under Regulation 2016/679” contain an overview of the elements of valid consent under Article 4(11) of GDPR (freely given, specific, informed, and unambiguously indicated). The element free implies real choice and control for data subjects. As a general rule, the GDPR prescribes that if the data subject has no real choice, feels compelled to consent or will endure negative consequences if they do not consent, then consent will not be valid. If consent is bundled up as a non-negotiable part of terms and conditions it is presumed not to have been freely given. Accordingly, consent will not be considered to be free if the data subject is unable to refuse or withdraw his or her consent without detriment. The notion of imbalance between the controller and the data subject is also taken into consideration by the GDPR. This point is particularly helpful, because it makes it easier to determine whether visitors of your website can freely decide if they want you to process their data. Unfortunately, this won’t be the case with data controllers who are public authorities and employers – the balance of power is skewed and there is a risk that users’ consents will not be fully voluntary. Such an organization should use one of the five other lawful processing means (yes, there’s five more of them). Also, it’s important to emphasize that consent should never be a prior condition for using your site or taking advantage of your services. For instance, it can’t be included in the terms and conditions of a website. This prevents the user from having a free choice when making decisions regarding consent. Important tip: If you can’t provide your users with a genuinely free choice regarding the processing of their data, consent is not the best legal grounds for you to choose. In this scenario, you should seek other ways to justify your right to process users’ personal data. As you can see, the Article 29 Working Party guidelines advise you to indicate every possible purpose for using user data. That way, you’ll make sure they give you specific consent for processing their data in a particular way. In practice, this means you’ll need a separate consent for every use of personal data. For example: one for content personalization activities and another for remarketing campaigns; one for using first-party cookies and another for third-party cookies. All these should be listed in the consent box displayed to users when they visit your page for the first time. However, it’s likely that not every purpose for using personal data will require direct user consent. Some experts predict that the Regulation on Privacy and Electronic Communications (also known as ePrivacy) in its current (and still not final) form will exclude from this list, among other things, cookies used exclusively for analytics purposes. Unfortunately, we still have to wait to see how everything unfolds when the regulation assumes its final form. Until then, it’s safe to assume that using web analytics trackers will also require consent. Important tip: Make sure that your cookie consent box lists every purpose you have for using personal data. Otherwise, you can’t say that your users’ consents were specific. The GDPR reinforces the requirement that consent must be informed. Based on Article 5 of the GDPR, the requirement for transparency is one of the fundamental principles, closely related to the principles of fairness and lawfulness. Providing information to data subjects prior to obtaining their consent is essential in order to enable them to make informed decisions, understand what they are agreeing to, and for example exercise their right to withdraw their consent. If the controller does not provide accessible information, user control becomes illusory and consent will be an invalid basis for processing. The consequence of not complying with the requirements for informed consent is that consent will be invalid and the controller may be in breach of Article 6 of the GDPR. The most important thing in this case is the fact that you must clearly explain to people what they are signing up for. Individuals should be informed that they are consenting to the processing of their personal data. Additionally, they should be aware of their rights concerning the given consent, like the right to withdraw it, the right to correct their data, and other rights. If your consent request doesn’t meet this requirements (in other words, it’s vague, difficult to understand, or not separate from other matters) it will be considered invalid. The GDPR is clear that consent requires a statement from the data subject or a clear affirmative act which means that it must always be given through an active motion or declaration. It must be obvious that the data subject has consented to the particular processing. A clear affirmative act means that the data subject must have taken a deliberate action to consent to the particular processing. Recital 32 sets out additional guidance on this. Consent can be collected through a written or (a recorded) oral statement, including by electronic means. turning a smartphone around clockwise or in a figure-eight motion. It means that the consent is considered valid only when the data subject had to take action in order to agree to your request. Pre-clicked boxes are no longer an option. We hope that all these requirements haven’t scared you too much. Of course, the new demands change many things in the way you deal with data, but there are a ranges of solutions and possible scenarios to ensure compliance with the new law. What’s more, we’ll present the most important advantages of GDPR Consent Manager – a tool designed to collect, manage, and store user consents. 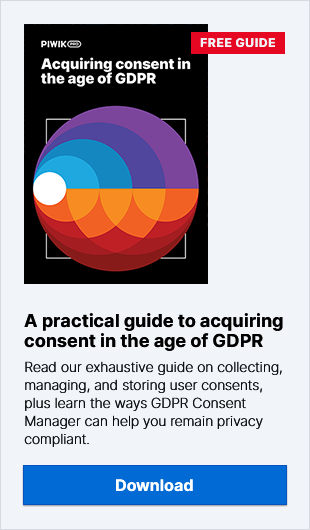 Read our exhaustive guide on collecting, managing, and storing user consents, plus learn the ways GDPR Consent Manager can help you remain privacy compliant.